Chances are, if you're taking an Anaheim vacation, you're coming here in order to visit Disneyland! The Magic Kingdom is about a mile from both my Disneyland vacation timeshare rental and my Dolphins Cove timeshare rental. Disneyland draws visitors from all over the world, but keep in mind that Anaheim, and Orange County, hold much in store for you! The new Anaheim Garden Walk, just a short walk from WorldMark Anaheim, is home to bustling fashion, food and fun with 44 stores and restaurants to make your Southern California vacation even more sensational. Angel Stadium is located just a few miles east of Disneyland at 2000 Gene Autry Way, Anaheim, 92806. Tours meet just outside the Home Plate Gate in between the red hats. The "behind-the-scenes" tour ($3 adults, $2 children) is both an enjoyable and educational experience. You will be invited to view areas that are normally restricted to the public. The complete tour includes a visit to the following areas: Press Box, Press Conference Room, Clubhouse, and Dugout. Practically across the street from the Stadium on the Honda Center, where you can watch the Anaheim Ducks! Will you get "teed off" if you don't work a little golfing into your Anaheim vacation? You're in luck! There are FIVE courses in Anaheim and the surrounding areas. Hands-on, interactive, kid-focused museums make learning fun! There's nothing like MUZEO (241 S. Anaheim Blvd; Anaheim, CA 92805), a 21-st century reinvention of the traditional museum. Adult admission is $13, $9 for children 4-12, and children under 3 are free. Located in the heart of Downtown Anaheim, the MUZEO hosts three traveling, interactive exhibitions every year selected for their cultural, educational, and pop culture merits. The next two exhibits are Miradas: Mexican Art from the Bank of America Collection and Divine Reflections: Russian Icons & Artifacts. The first Sunday of each month is free at the Bowers Museum and Bowers Kidseum (2002 N. Main Street; Santa Ana, CA 92706). All activities are also free on these days. The Bowers Museum, a world-class, internationally-celebrated institution of art and culture dedicated to the preservation, study and exhibition of arts from around the world. Enjoy lunch in Tangata, a Patina Group restaurant. Catering and event facilities available. The Bowers Kidseum is open weekends and offers hands-on exhibits and art projects for all ages. Discover the Discovery Science Center (2500 N. Main Street; Santa Ana, CA 92705). Admission for adults is $12.95; kids ages 3-17 are $9.95. Discovery Science Center is celebrating "A Decade of Discovery" as the Cube turns ten! The center has 59,000 square feet of exhibit space packed with interactive science exhibits designed to spark children's natural curiosity. Head another 30 miles south to enjoy SeaWorld San Diego, the San Diego Zoo, and the San Diego Wild Animal Park. For a beach fix, surfing mecca Huntington Beach and chic Laguna Beach are less than 20 miles away. Knott's Berry Farm (8039 Beach Boulevard; Buena Park, CA 90620) is about a 15 minute drive north from Disneyland. See Camp Snoopy, the gold rush village and Ghost Rider — one of the best wooden roller coasters in the country. Please note, the fried chicken and biscuits at Mrs. Knott’s Chicken Dinner Restaurant used to be AMAZING about 15 years ago, like the kind of amazing you would tell your friends about. However, I visited again a few months ago and found that the food was a poor match for my memory. I was really disappointed. Great rides, yes, but try another restaurant. If you're lucky enough to have a few extra days in your Anaheim vacation, head north to Universal Studios Hollywood (100 Universal City Plaza; Universal City, CA 91608). There you'll find Jurassic Park and other movie-themed rides, plus CityWalk for dining, shopping and nightlife. Universal Studios is 37 miles from Anaheim. Six Flags Magic Mountain & Hurricane Harbor (26101 Magic Mountain Parkway; Valencia, CA 91355) is 62 miles north of Anaheim. Magic Mountain has many roller coasters including the world-famous Scream with seven 360-degree inversions. It's Hurricane Harbor is a water park with a manmade tropical lagoon. 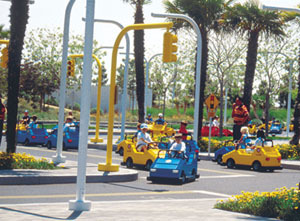 Legoland California (1 LEGOLAND Drive; Carlsbad, CA 92008) is 62 miles south of Anaheim. Lots of things for very small kids (under 2) with rides and shows. Pacific Park (380 Santa Monica Pier; Santa Monica, CA 90401) is 42 miles north west of Anaheim. As California’s only amusement park located on a pier, take in a great time aboard the ferris wheel, roller coaster and at the great big arcade. Take a hot-air balloon ride during your Anaheim vacation. Balloon rides are available Thursday and Friday, from 10 am through 3pm, and again from 7pm through 10pm. Rides are also available Saturday and Sunday, from 9 am through 3pm, and again from 7pm through 10pm. The helium (not hot-air...oops!) balloon, which is located in the 27.5-acre Preview Park, provides a great view of Orange County from 400 feet in the air. There is a charge for parking, but each balloon ride is free. All Aboard the Balboa Island Ferry! Balboa Island and Balboa Peninsula are parts of a complex of waterways just south of Newport Beach. What's YOUR favorite thing to do in Anaheim? There is so MUCH to do during an Anaheim vacation. What's YOUR favorite? Jump to the bottom of the page to tell us what YOUR favorite thing is to do during an Anaheim vacation. You can either drive onto the island and take the 5-minute Ferry ride over to the Peninsula, or drive along the Peninsula and take the Ferry to Balboa Island. On the Island, you'll find nearly 70 little shops, restaurants, and coffee houses. This historic and scenic trip operates from 6:30 a.m. - midnight Sunday through Thursday, and 6:30 a.m. - 2:00 a.m. Friday and Saturday. During the summer, the Ferry hours are 6am to 2am daily. Anaheim's Yorba Park (7600 E. La Palma; Anaheim, CA 92807) is over one mile long, nestled in the mouth of Santa Ana Canyon, along the Santa Ana River. Orange County has nearly 40,000 acres of parks, historical and coastal facilities and open space just waiting for you. Click here to see a list of all of Orange County's Parks [opens in a new window], organized by City. I like to visit arboretums every chance I get, especially when they're FREE like the Fullerton Arboretum! You'll find this gem of natural beauty at 1900 Associated Road; Fullerton, CA 92831. Encompassing 26 lush acres, The Fullerton Arboretum has assembled a permanent collection of over 4,000 unique and unusual plant species from around the world. With its ponds, streams and wildlife, the Fullerton Arboretum offers a tranquil retreat from a fast-paced urban life. You'll find 4000 plants and trees, the 1894 Victorian “Heritage House”, the Heritage Museum, a Nature Center, and a Children´s Garden. And no Anaheim vacation is complete with out a trip to the BEACH! For the truly authentic Southern California experience and a chance to splash around in the sapphire waters of the Pacific Ocean, make plans to visit the beach, only a short drive away. The Huntington Beach Pier is a great place to stroll, surf, snack, and shop. Be sure to amble along Main Street to visit the Surfing Walk of Fame, the International Surfing Museum, and the Surfers' Hall of Fame, in addition to plenty of places to get your beachwear and some delicious eats. One of the premier spots to catch the perfect Southern California sunset, Huntington Beach Pier and Main Street are iconic Orange County destinations. Unique features include live concerts, boutique shops and the red-roofed Ruby's Diner at the end of the pier. July 15, 2011 - August 14, 2011 at the OC Fair & Event Center (88 Fair Drive, Costa Mesa, California 92626). This year's theme is: LET'S EAT! The annual Fair features food, animals, carnival rides & games, competitive exhibits, concerts, community entertainment & more. Admission: General $11, Senior (60+) $8, Child (6-12) $6. Children 5 and under are free. Parking is $7 for General Parking, and $12 for Preferred Parking. Visit the Official OC Fair [opens in a new window] website for more info. Wow...there sure is a lot to do during an Anaheim vacation! What do you love to do when you're in Anaheim? What would you suggest to someone visiting Anaheim?